Consistently through thin and thick. With the ByStar Fiber laser cutting system, Bystronic presents a high-end all-rounder that uses the full potential of fiber laser technology. In addition, the intelligent automation ByTrans Cross speeds up the material flow. 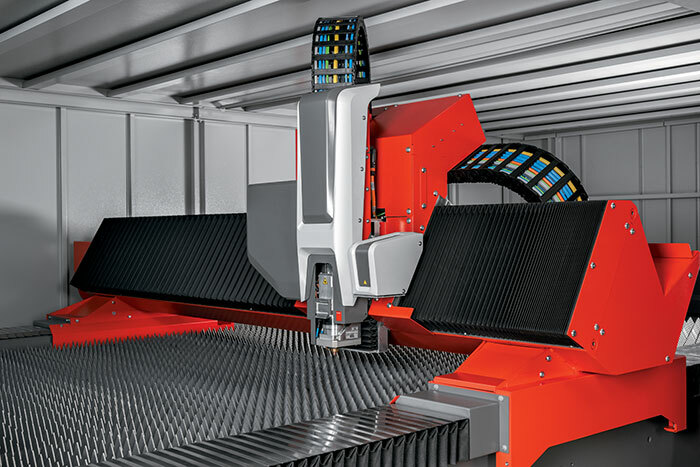 With a fundamentally redesigned machine concept, Bystronic is redefining fiber laser cutting and thereby expanding the range of applications of the cutting technology. With its uncompromising high-end performance, the ByStar Fiber is aimed at users who want to rely fully on fiber laser technology. Users who will in future cut their entire range of orders using the fiber laser: from stainless steel, through to aluminium and mild steel, right up to non-ferrous metals such as copper and brass. And all this from thin to thick with consistently high cutting quality. The great innovation of the ByStar Fiber lies in the single-mindedness with which Bystronic developed this fiber laser. Right down to the smallest detail the machine is geared towards fiber laser cutting, without compromises, regardless of high cutting dynamics, seamlessly tying in automation solutions, intelligent sensor technology or the integration into modern software systems. With the new 10 kilowatt laser, Bystronic is launching the next performance level on the ByStar Fiber. The high-end system thereby offers the highest level of laser power in Bystronic’s portfolio. The technological leap from the previously available 4 and 6 kilowatt systems to the new 10 kilowatt level is tremendous. Compared with the industry standard 4 kilowatt fiber lasers, the 10 kilowatt aggregate increases the cutting speeds on the ByStar Fiber by as much as a factor of four. This enables users to cut four times the number of sheet metal parts in the same time as most of their competitors. The greatest speed benefits can be achieved in material thicknesses between 3 and 12mm. However, the 10 kilowatt fiber laser also achieves incredible speeds in sheet thicknesses up to 30mm. This is interesting for all those users who rely on fiber laser technology for their cutting processes. And for those who want to set themselves clearly apart from the competition thanks to fast cutting speeds. However, fast cutting speeds alone do not accomplish the objective. Users who cut at high speeds must also be able to quickly load the required raw materials and subsequently unload the machine. A 10 kilowatt ByStar Fiber really goes through vast amounts of material. The laser system’s speed simply screams for an automation solution. Because of this the powerful laser output must be optimally supported by an automated loading and unloading solution. With the ByTrans Cross, Bystronic has developed a new loading and unloading solution for the ByStar Fiber. What makes it so special is the great freedom it offers users. The ByTrans Cross has accomplished the balancing act, which has until now, always pushed conventional automation approaches to their limits: automation for large series and simultaneously sufficient flexibility for small jobs. The modular design of the ByTrans Cross opens up several possibilities for users to integrate the loading and unloading system into their manufacturing environment. Possibility 1: The ByTrans Cross can be connected to existing warehouses as an integrated loading and unloading solution. In this constellation, the automation solution forms a bridge between the warehouse and the ByStar Fiber laser cutting system. Possibility 2: The ByTrans Cross can also be used as a stand-alone solution without connection to the warehouse, in order to provide the ByStar Fiber with raw metal sheets in various thicknesses and materials. The basic version of the ByTrans Cross comes with two cassette carriages, which can be used to store raw material. However, it is also possible to use just one cassette carriage for the storage of raw material while the second carriage can be used to deposit the cut parts. Possibility 3: Whenever users want to process spontaneous jobs without interrupting the automated process, the ByTrans Cross offers sufficient freedom to load metal sheets onto the ByStar Fiber’s shuttle table or unload finished parts by hand or overhead crane. This is made possible thanks to the system’s slim design. The ByTrans Cross is positioned on the side of the laser cutting system’s shuttle table. This even makes it possible to load metal sheets using a forklift truck. The seamless integration of laser cutting into the up and downstream processing steps, of which the rhythm can change at any time, is an additional important aspect that the ByTrans Cross solves optimally. This is possible thanks to the integration of the automation system’s control into the laser cutting system’s user interface. This enables users to start the cutting process and the automated material flow with just a few taps on the laser cutting system’s touch screen. To achieve this, Bystronic developed the ByVision Cutting user interface, which is already successfully being used with the latest generation of Bystronic’s fiber lasers. 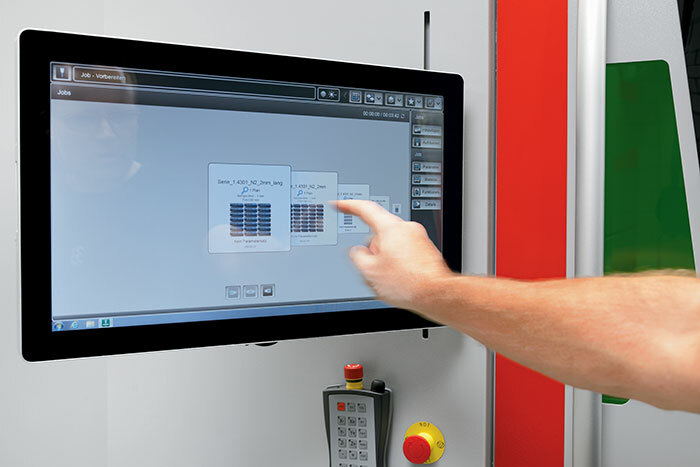 ByVision Cutting integrates all the cutting processes and the associated automation solutions. During everyday production this allows laser cutting and the automated material feeding and removal process to be seamlessly interlinked. Nowadays, no user should waste time, walk long distances, and carry out unnecessary procedures just because the laser cutting system and the connected automation solution have to be operated using separate terminals. After all, for the operator, automated laser cutting also means convenience.